It is nearly the end of the last one-week Project QUILTING challenge of the season. 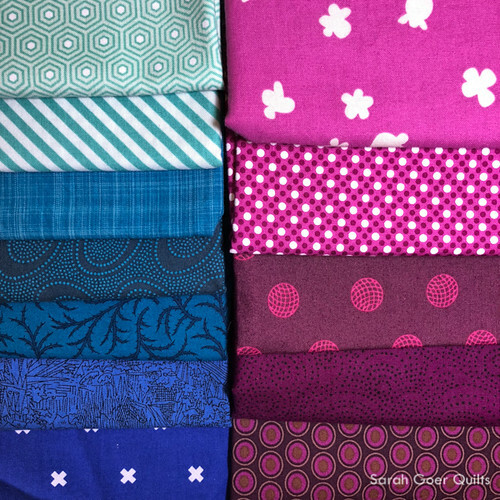 The challenge for this week is SCRAPtastic and requires that we use at least 12 fabrics. 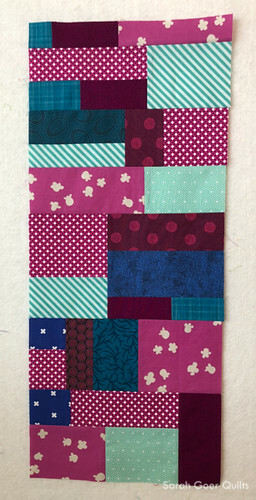 I started with one of my newsletter palettes from this week and built a fabric pull from my stash around those colors. At this point I didn't have a solid plan for what I'd make and I had one day. I considered a workshop sample or another mini quilt based on a letter of the alphabet, and I finally settled on making a lined drawstring bag as a gift for a friend. I made an open wide zipper pouch as a gift for an earlier Project QUILTING challenge this season. Since the theme of the challenge was SCRAPtastic, I decided on some improv piecing. I basically sewed slabs together and then cut them up to attach the pieces to other units. Just like my quilts, the slab was stitched with Aurifil 50wt thread and seams were pressed open. I needed a panel that was 10 1/2" by 24 1/2" for the exterior of the bag. (I opted to not have an accent fabric along the top of the exterior.) I worked from yardage, but this technique could easily be applied to scraps! 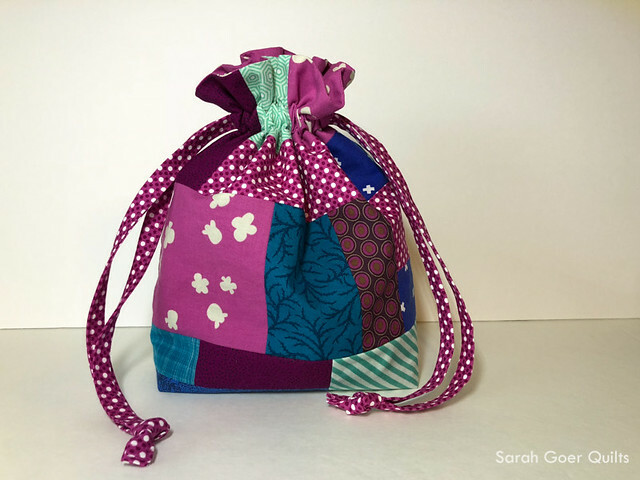 I love this tutorial and have made numerous lined drawstring bags in the past. It's a quick project. I sewed this up, including the scrappy exterior, in an afternoon. And it doesn't require any interfacing or hardware. Quick and easy! Voting is open for the Craftsy 2018 Quilt Designer Fellowship. I'm a finalist and I'd be so excited to win! If you haven't voted yet today, click over to see the work of the ten finalists and vote for your favorite. Voting ends on March 23 at 11:59pm MST. I'm linking up to Project QUILTING, Needle & Thread Thursday, and Finish It Friday. Posted in Quilting. 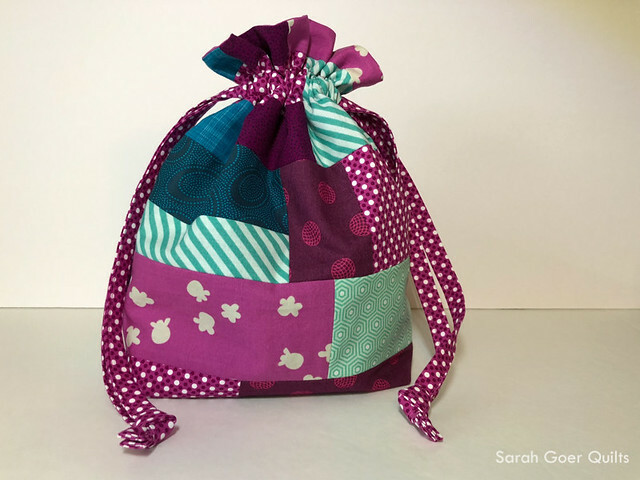 Tags: lined drawstring bags, Project QUILTING on March 22, 2018 by sarah. What a great idea! Lovely deep colours! Thank you. I gave it away today. I may have to make something else in this palette, because I really enjoyed it. 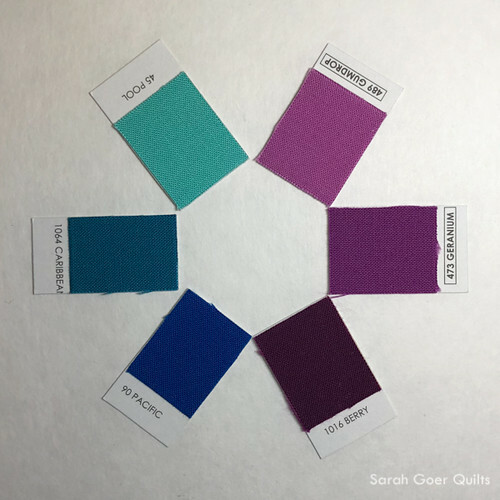 Love your color combination, Sarah! What a cute bag! Thank you for hosting TGIFF! Thank you, Paige! I love how quick the project is! Of all the ones I've made, I hadn't made a scrappy one. Thanks for visiting, Leanne! Using some of the fabric from the piecing for the drawstring ties it together very nicely! While making the ties is the pickiest part of the pattern, I really like the look of coordinated ties. :-) Thanks for visiting, Yvonne. Sarah, your fabric pull and the improv piecing yielded a terrific pouch! I love these for lunch bags - so does my daughter, and gets lots of positive comments from fellow college students about them. I love that it's so easy to wash them! So true about washing them! With no hardware or lining that's a nice feature. I've given most of the ones I've made away (including this one today), but my kids have a couple that they use for toys. I now all my son's matchbox cars are in one of them. Thanks for visiting, Lynette! Love love love that bag! I must make one or two or three. It's so easy to make a bunch of them at the same time. The first ones I made used a fat quarter pack of 8 fabrics and I made five bags. Thanks for visiting, Deana! I love this tutorial as well. I bought the pattern to get the other sizes. I'm behind in blog reading so didn't get to link up my finish. I survived Project Quilting. Thanks for the encouragement to play along. I also bought the pattern... I made one project bag as a gift. I'll have to look into other sizes! Thanks, Vi! I really like using scraps to build a slab of fabric. I'm glad this one came together so nicely.